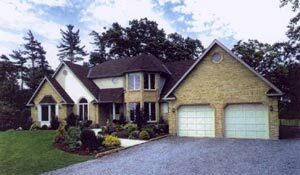 This beautiful stucco and stone masonry Tudor design opens to a formal foyer that leads through double doors into a well-designed library, which is conveniently accessible. One other select option in this design is the separate cedar closet to use for off-season clothes storage. The master bedroom offers a vaulted ceiling and a huge bath area. Other features are an oversized living room with a fireplace, an open kitchen, and a connecting dining room. A utility room and half-bath are located next to a two-car garage.